Our founder, Carlos Menendez's original blend served in only the finest restaurants in Florida. This blend while it is promoted as European makes the best Cuban style coffee I have had. It has a very well balanced acidity with a hint of smoke. I found it a superior blend to the Navieras and Cafe Con Leche. I won't even bother comparing supermarket shelf coffee to this or any coffee blend found on the El Molino site. Store bought coffee is simply trash compared to any of these blends. I found this coffee specially pleasing in the afternoon around 2 pm when I am getting drowsy at work. I have an electric cafetera in my office and Don Carlos is my companion in the afternoon. Forget Starbucks, this blend is much superior and I haven't tried it in a pump espresso machine which would probably make this blend taste even better bringing out more of the coffee oil. It is heavy on the oil which makes it a bit more difficult when grinding the beans but not that bad. If I could only recommend one blend from El Molino it would be this one. This coffee is rich and deep. 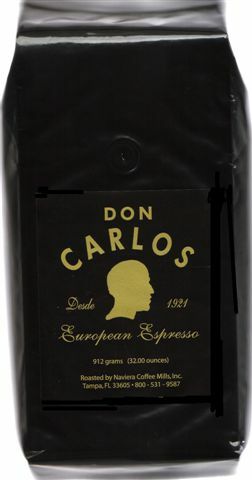 If you are looking for a true Caribbean espresso experience, try making Don Carlos in a cafetera. Add the generous helping of raw sugar and top your demitasse (don't mix) with some frothed, heated milk for that classic Cuban coffee experience. Sip the coffee through the milk. A piece of heaven from the tropics.